Symposium Technologies is pleased to announce an agreement with Point to Point Communications to provide centralized GPS/AVL, Mobile Data, Dispatch and other location-based services for their diverse portfolio of public and private sector clients. Point to Point Communications has been recognized by Motorola as one of its largest systems dealers, and services clients in a wide range of fields such as trucking, utilities, concrete, public safety, transit, public works, and many others. 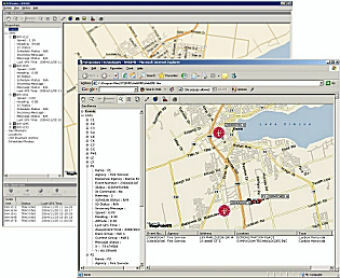 More and more over the last several years, clients have been asking for software systems that will help them track mobile assets, enable real time data sharing between head office and the field, and provide customized dispatch, scheduling and other applications that will reflect their needs and enhance their effectiveness. Point to Point for its part, has been actively evaluating different systems that could be used in an “ASP” or “Application Service Provider” Model, wherein the software applications and computer infrastructure are housed centrally with the provider, who is responsible for all service, administration and support. Clients in turn connect to the application over a network via their own private account and receive all benefits for a monthly or yearly fee. The advantage is that clients get access to powerful software applications while avoiding the overhead involved in up-front license fees and service contracts, as well as avoiding the need to deal with such issues as system administration and hardware. While the ASP model has held out a lot of promise as a way to help businesses and agencies put powerful new technologies to work for them, until now the applications that were available were either highly specialized, or very generic. As a result they couldn’t reflect the actual mission and requirements of business and government clients to the degree necessary to make them useful beyond a small range of potential users. Point to Point’s clients also seem very keen about the new service, with the first client already moved over and several more in trials, the feedback to date has been excellent. “The future of our business is value-added” Ken went on to say, “and our agreement with Symposium is a major step to ensure we meet client’s evolving needs, providing the highest value at the lowest cost”.